This week's Wisdom Wednesday features a letter written in 1915 by my 2nd great grandmother, Susan Eleanor (Templeton) Kephart, wife of Alexis Elihu Kephart. Susan and Alexis were prominent farmers for over 30 years, and they both won various prizes and awards for their farming, which I will highlight in other posts later on. But for today, I wanted to share a bit of wisdom from Susan by way of this letter, written as part of a writing contest for women that was featured in the Farmer's Champion newspaper of Elgin, Oklahoma in May of 1915. It is entitled, How to Lift the Mortgage. I don't know the results of the writing contest, so I'm not sure if Susan won or not. But I won when I found this article, because it gave me some wonderful insight into the mind of my great, great grandma Susan. She was smart and tough and very well-spoken, and she was dedicated to being the best farm wife she could possibly be. I'll share more about Susan in future posts. 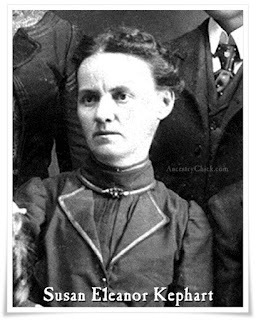 She is indeed one of my favorite ancestors.